This article has been updated and republished to clear up some points, and add another section. The comments for this article are closed, please comment at the new article. One of the most ridiculous pseudoscientific claims that I keep hearing from the junk medicine crowd is that this supplement or that food is critical to boosting the immune system – it’s so prevalent that I believe I read it several times a day. These type of claims ignore one basic physiological fact: the immune system is a complex interconnected network of organs, cells, and molecules that prevents invasion of the body by hundreds of thousands, if not millions of pathogens every day. And no matter how much individuals try to trivialize how complicated the immune system is by claiming that downing a few tablets of echinacea will boost the immune system to prevent colds (it doesn’t), it doesn’t make it science. And it isn’t that simple. Now comes the science part of the article. I, and others, always complain that the junk science world massively oversimplifies the mechanisms of the immune system. They make it sound like there is just one pathetic, weak, hardly functional little organ called the “immune system” that apparently can be knocked out if you drink the wrong water. But in fact, the immune system is a huge, complex, interrelated bunch of biomolecules, cells, tissues and organs, usually all working in harmony. And it’s pretty resilient. If the immune system was such a weakling, we would all be dead from pathogens before we made it to our 5th year of life. And there is a reason, why we make it past your 5th year of life, but I’ll get to that. Anatomical barriers–These consist of physical barriers. The skin itself is impermeable to pathogens providing defenses like a solid wall. Our nasal passage is lined with mucous that is constantly moved into the stomach catching pathogens and killing them. Our eyes are covered in caustic tears and our mouths in saliva which contains a variety of enzymes. all these ensure that the vast majority of pathogens are killed before they can even enter an area where they can cause harm. Inflammation–This response include the symptoms we associate with inflammation, fever, swelling, increased blood flow, and other activities, is due to the localized response of the body to the presence of a foreign body or pathogen. It’s main purpose is to provide a physical barrier to control the spread of infection and to heal damaged tissue in the region. Damaged cells release an array of chemical factors which cause pain and blood vessels to become more permeable. This response then attracts phagocytes, cells which recognize and consume foreign or dead tissue. Inflammation is normally a healthy response to injury or pathogen invasion, but in some autoimmune diseases, such as rheumatoid arthritis, it can be painful and debilitating. Complement System–This system is group of biochemicals, produced by the liver, that helps or “complements” the ability of antibodies and phagocytic cells to clear pathogens from an organism. It is part of the immune system that is not adaptable and does not change over the course of an individual’s lifetime. However, it can be recruited and brought into action by the adaptive immune system. Mast Cells – A group of cells that mediate the inflammatory response. Although they are often associated with allergies, they are a critical part of the immune response. Phagocytes – Large cells that move like amoeba. They “eat” other cells by surrounding them with their plasma membranes producing “bubbles” in which they can release enzymes safely without damaging other cells. They also have a “clean-up” role to remove the body’s dead and dying cells. Macrophages – Large phagocytic cells that efficiently consume multiple pathogens. Heavily motile and actively cross from the blood stream into tissue to hunt down pathogens. They kill by manufacturing and releasing free-radical oxygen in a local area. Neutrophils/Eosinophils/Basophils – A group of similar cells that are the “first responders” to migrate to an inflammation site. They appear at the site of a wound within a few minutes of trauma. Natural Killer Cells – These cells recognize the body’s own cells that are infected by viruses or are cancerous. They then induce controlled cell death to halt the spread of the infected or cancerous cells. Recent research shows that Natural Killer Cells also play a role in the adaptive immune response. Dendritic Cells and Gamma/Delta T Cells – These are the bridge between the innate and adaptive systems and their main role is antigen presentation. They harvest antigenic proteins from damaged pathogens and present them to T-Cells, which allows them to find and attack the pathogens. Visual depiction of the innate immune system. Adaptive–The dendritic cells, from the innate immune system, activate the body’s adaptive (or acquired) immune system. The adaptive immune system is composed of highly specialized, systemic cells and processes that eliminate or prevent pathogen growth. In acquired immunity, pathogen-specific receptors are “acquired” during the lifetime of the organism (whereas in innate immunity pathogen-specific receptors are already encoded in the germline). The acquired response is said to be “adaptive” because it prepares the body’s immune system for future pathogenic challenges. In some cases, the acquired immune response can be maladaptive when it results in autoimmunity. Antibodies, produced by B-lymphocyte cells, are the main weapon of the body’s immune system to battle pathogens. It is a larger response than innate immunity and once sensitized to an antigen, the adaptive immune system often fights of diseases even before we can exhibit symptoms of disease. Immunizations introduce the pathogen’s antigen to the adaptive immune system so that it can form those pathogen-specific receptors and, thereby, are able to quickly and efficiently respond to an attack by a pathogen. 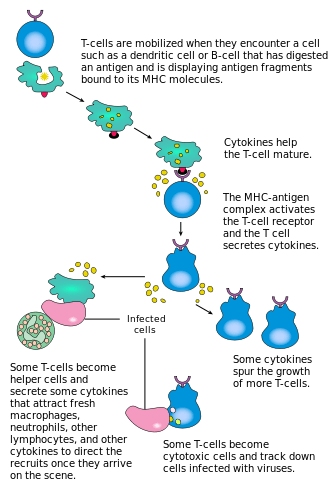 T – Lymphocytes (also known as T-cell) – The main role of the cell is to recognise cells infected by viruses and trigger the apoptotic pathway that destroys the cell and its viral contamination. Since viruses only replicate inside cells by hijacking the cell’s manufacturing process, this apoptosis kills the virus (and the host cell) and phagocytes swoop in to consume the destroyed cell debris and digest the contents. 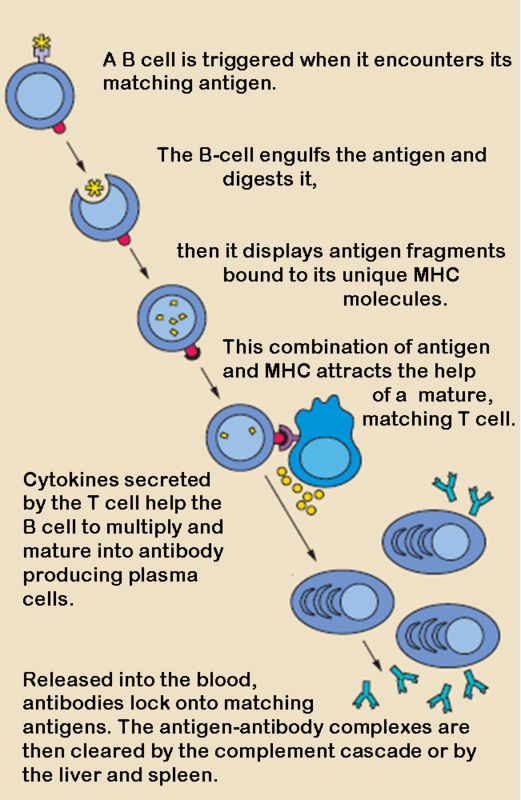 The antigen of the viral cell is recognised by surface antibodies on the T-Lymphocyte, which activate it. There are also helper T-Cells whose role is control and organisation of the apoptosis response to the infected cells. B – Lymphocytes – The main role of these cells is to produce humoral (free floating) antibodies that recognise pathogens and mark them for destruction by other cells. This process occurs by activating the complement system and by causing the pathogen to become “sticky” but only with other pathogens. This causes them to clump together and make them easier to kill by T-cells. Memory Cells – After an infection has passed (and most of the T-cells and B-cells have died), a few do remain in circulation to remember the antigens of the pathogens who attacked. In future infections these are rapidly activated to produce a humoral response which quickly destroys any new infections even before they produce any symptoms. There are two types of these cells: Memory B cells, which, produce the antibodies that recognize the pathogens, and Memory T cells, which remember the viral antigens that infect cells. Note: in Infants, there is a version of the immune system called passive immunity. Certain classes of antibodies can cross the placental barrier and can be absorbed through milk particularly the colostrum (first milk). These give the new born baby the same range of protection as the mother. However, the baby’s immune system does not develop its own adaptive immune response from these antibodies, and eventually must be presented with one of the millions of antigens it inhales every day to form its own adaptive immune system. The innate and adaptive immune systems are pretty freaking awesome, but it’s not perfect. Pathogens have evolved over a billion years or so in response to other organisms’ immune systems, so they have developed all kinds of tricks to avoid being massacred by the human immune system. The influenza virus is one of the experts of quickly evolving to change itself almost annually to avoid the immune system. HPV (human papillomavirus) avoids the immune system by actually integrating itself into the human DNA. So, we have an effective and highly aggressive immune system already. So obviously there are ways to boost this system. Right? So, there’s the awesome complexity of the immune system. There is a multitude of immune system related cells, each produced in different areas of the body, each with a different responsibility. Some of these cells produces literally millions of different antibodies, each with a separate responsibility to attack diseases. And precisely what substance could make that highly complex system work better? In general, the immune system is an on/off type of network. It’s either working perfectly well, or it isn’t, and we know the precise conditions that might cause the immune system to start working less perfectly. There are some chronic conditions, such as stress and malnutrition (I’m not talking about not enough oranges, but large, long-term calorie deficits), that can reduce the performance of your immune system. There are a few chronic diseases that can have an impact on the quality of the immune response, diabetes being one of the more prevalent, but there are many others. Some people are born with impaired immune systems. Some may acquire an immune deficiency as a result of certain diseases (HIV/AIDS being the most famous). Even some medical treatments, like chemotherapy or immunosuppresive therapies, can weaken or even destroy the immune system. An infection does not weaken the immune system; in fact, the sick feeling you have during a cold or other disease, can be a part of the immune response. Almost everyone has a perfect and highly effective immune systems–there is no way to make it better. OK, there might be one way, but it will take some thought to figure it out. In fact, there are reasons why we shouldn’t have a too powerful immune systems. For example, overactive immune systems are responsible for allergic conditions such as asthma and eczema. And there’s a type of runaway immune response known as a ‘cytokine storm‘ which is responsible for causing deaths in severe flu pandemics. The immune system can become misdirected and start attacking the cells of the host body. This immune system error can cause autoimmune diseases such as arthritis and Type 1 diabetes. There is little evidence that a normally functioning immune system can be ‘boosted’. ‘Boosting’ the immune system is probably not a good idea. Allergic reactions give us an indication of what happens when our immune systems are overactive. There are ways to prevent diseases like cancer. But it has nothing to do with boosting the immune system. So what we need is a way of beating diseases at their own game. A way of acquiring immunity to diseases without the disease itself. Let me think of a way, it’ll come to me. That way is vaccination. Despite the complexity of the innate and adaptive immune systems, vaccinations are among the simplest medical procedures ever: we take known antigens and inject them into the body. The body’s adaptive immunity system recognizes these antigenic particles of the pathogen, and produce an immune response as if there were a real threat. Then the memory cells stick around to attack subsequent infections. Every infection your immune system stops actually increases the quality and speed of your immune response. As long as we have been vaccinated, the adaptive immune system can respond quickly to a pathogen, prior to its having a long-lasting deleterious effect on the body or becoming infectious and spreading to others. No one makes the claim that vaccines are 100% effective, but as long as the vast majority of individuals are immune to a disease, it has a lower chance of spreading. The immune system is a complex interaction of organs, cells, proteins, other biochemicals, and tissues. The immune system basically works well as a result of a billion years of evolution. Only a chronic disease or chronic malnutrition can make it work worse. No we can’t boost the immune system with a handful of supplements or eating organic foods. The one way we make the immune system work better is through the scientific principle of vaccination, which maneuvers our bodies into thinking that it has fought of a disease when in reality it has not. Then it is ready to fight the disease when it shows up. Just relax. Your immune system is so powerful, you really don’t have to worry about it. Editor’s note: This article was originally published in September 2013. It has been completely revised (shortened) and updated to include more comprehensive information, to improve readability and to add current research. Arina A, Murillo O, Dubrot J, Azpilikueta A, Alfaro C, Pérez-Gracia JL, Bendandi M, Palencia B, Hervás-Stubbs S, Melero I. Cellular liaisons of natural killer lymphocytes in immunology and immunotherapy of cancer. Expert Opin Biol Ther. 2007 May;7(5):599-615. Review. PubMed PMID: 17477799. Clark IA. The advent of the cytokine storm. Immunol Cell Biol. 2007 Jun;85(4):271-3. PubMed PMID: 17551531. Ferrero-Miliani L, Nielsen OH, Andersen PS, Girardin SE. Chronic inflammation: importance of NOD2 and NALP3 in interleukin-1beta generation. Clin Exp Immunol. 2007 Feb;147(2):227-35. Review. PubMed PMID: 17223962; PubMed Central PMCID: PMC1810472. Janeway CA Jr, Travers P, Walport M, et al. Immunobiology: The Immune System in Health and Disease. 5th edition. New York: Garland Science; 2001. 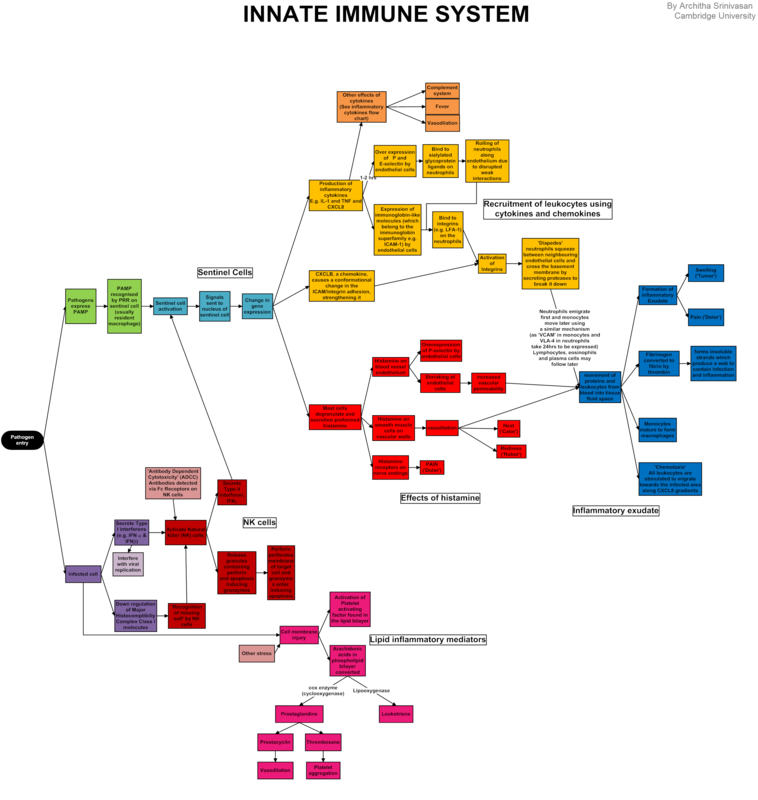 The complement system and innate immunity. Lohman RJ, Cotterell AJ, Barry GD, Liu L, Suen JY, Vesey DA, Fairlie DP. An antagonist of human protease activated receptor-2 attenuates PAR2 signaling, macrophage activation, mast cell degranulation, and collagen-induced arthritis in rats. FASEB J. 2012 Jul;26(7):2877-87. doi: 10.1096/fj.11-201004. Epub 2012 Mar 30. PubMed PMID: 22467762. Note: I have, without any conscience, liberally stolen the idea for this article, and some of the supporting information from fellow blogger and Australian Graham Coghill of the most excellent blog, Science or Not.